I was going to make some frozen french fries for supper. As I've never had adequate pots and pans storage, I keep baking sheets in the oven. I pulled them out and took one for fries. I don't know the age of this pan. We're talking a long time. It gradually darkened over the years and I read somewhere that this natural patina is good for baking. Of course, you need to scour the pan clean after use, but pans were made for an accumulation of "dark" around the edges. But, what we have here is not an accumulation of dark, we have rust. After I wash a cookie sheet, I let it air dry for a bit and then stick it in a warm oven, about 150 degrees. This makes sure that there is no moisture on the pan when it's stacked and stuck back into the oven for storage. So, where the rust came from, I don't know. What I do know is that marks the end of the line for this cookie sheet. Rust is not something you can cover with shortening and then drop a chocolate chip cookie on. 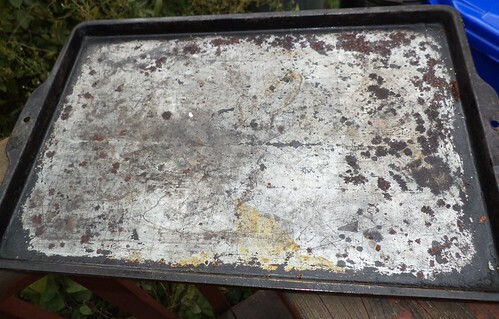 Rust is the deterioration of the cookie sheet itself. It's time to let it go. I tossed this sheet and pulled out a different one and made my fries. Well, it's good it's happening now. My birthday is this month.